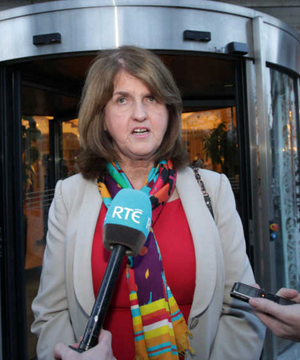 For years, we have heard a litany of Government ministers and TDs offer sympathy to the couples involved, wring their hands, and agree that “something” must be done. But they have done nothing. Doing nothing is simply not an option anymore. 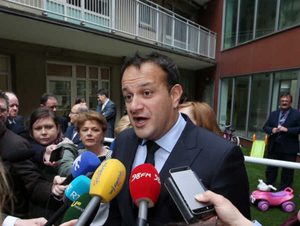 Roughly two diagnoses of fatal foetal abnormality are made in Holles Street alone each week. The Liverpool Women’s Hospital sees between two and four Irish women every week, with a five-week waiting list. Each week’s delay is subjecting more and more people to cruel and inhumane treatment. When the bill was moved last year, the Government relied on the advice of the Attorney General, which suggested that it was unconstitutional as a result of the Eighth Amendment. They are again seeking her opinion this time round. I want to see that opinion published. It cannot be used as a fig leaf to cover the inaction of politicians. The truth is that all it is is an opinion. Actual unconstitutionality can only be determined by the courts. So why not allow the bill to pass, get the President under Article 26 to refer it to the Supreme Court? The Constitution allows 60 days to have the matter determined. If they agree it is compatible with the Constitution, then we can — at least in these circumstances — end the inhumane treatment of Irish women. If they find it is not constitutional, then we will only be in the situation that we are in now. 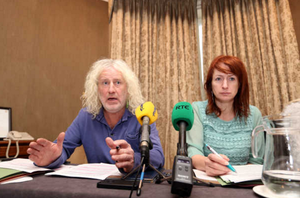 Independents 4 Change TD Mick Wallace writing in today’s Irish Examiner. Posted in Misc and tagged bill, Fatal foetal abnormality, Irish Examiner, Mick Wallace at 11:28 am on June 27, 2016 by Broadsheet. A referendum to change the Constitution is unconstitutional? Zut alors! and this is how nothing ever changes! Oh, wait, not a referendum, a bill because referenda have been repeatedly refused. In fact, they should be renamed refuserenda. What does it matter what they are like.! Clown. When Sesame Street is one of the most educational and beloved series on the planet, I’d take that as a compliment! whether you agree with their ideas or not, you have to admit they are really some of the only politicians actively working for change. Not what I first expected from Mick. It’s almost as if that pair spend a lot of time thinking about what would be good for the country, and no time at all worrying what anyone thinks of them. Yeah, I think we all know there are problems with some of the independents – some of them are even women who have the temerity to appear in public places without any apparent ambition to be models, for god’s sake – but I’m very relieved they are there. Daly, Wallace, Coppinger. Who else is speaking for the women of this country? Hilariously it is not him who would decide if it is unconstitutional, it would be up to the president to decide would’nt it? Nope, only the Supreme Court can decide that. could they not pass it then refer it to the supreme court and just not have it enacted? If DUP-ers with new Irish passports settled in the South (which they are entitled and welcome to, of course) – what do you think would happen with 08th? Ladies better tie them tubes and pronto, or contraception will be illegal again. Gentlemen had better hoof it off to get their vas deferens cut, tied or cauterized (burned or seared) – the ladies have been taking care of contraceptive matters for long enough. That’d make a vas deferens alright. If bill was to go to supreme Court and was to pass winning referendum on eight might be more difficult. FFA argument persuasive to many who are on the fence. I think it would fail but happy to let SC decide. But there could be unforeseen consequences. “unforseen consequences”? Like the “unforseen consequences” of the 8th amendment killing women, preventing travel for abortion (amended by referendum), preventing the provision of information about abortion (amended by referendum)? The 8th amendment has been a restrictive disaster from day one. Medical treatment should not be enshrined in the constitution. Was my point Daisy. Want 8th removed. If FFA law found not to breach it then any referendum to remove it will be harder. That was the unforseen consequence. But the right to life should. Otherwise you’d have people picking and choosing who had the right to life. You might have doctors performing medical procedures that would save women’s lives or ease their suffering, you mean. Which is to say that a decision has been made about who has the right to life and health, and it ain’t the women. 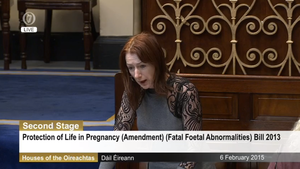 Does somebody want to try and explain how a bill that allows for the ending of the life of a very sick, terminally sick foetus might be consistent with the constitution as it currently stands. Because I can’t help thinking that people backing the bill know that it can’t be constitutional, wish it was, and just want to make a point by having the bill declared unconstitutional. Just wonder, if anyone has considered, electing Dustin the turkey, to the Dail. I mean one more, turkey is hardly going to make a difference. Or maybe real turkeys do make a difference.